another year has come and gone! i really can’t believe it. it still amazes me how some days can go by soooo sloooow and yet the years seem to go by so incredibly fast! each new year really allows for me to look back on the previous one and reevaluate what i spend my time on and determine if i’m taking the time to really focus on the things that matter the most. :: family is #1 obvi. i always talk about making room in my calendar to do fun things with my kids and while not everything that i want to do with them gets done, i really do make a concerted effort! :: this little blog of mine. since this is just an on-the-side gig and i don’t have the resources that some of the bigger blogs have (like hiring photographers, writers, and designers, etc), the amount of time i spend here really does ebb and flow depending on whatever else i’ve got going on in life. sometimes i stay up late night after night editing pictures and writing blog posts. other times it gets put on the back burner for weeks at a time. sometimes i respond to comments the same day and other times they sit around for a little while until i can get to them. and sometimes i even post on social media! and other times facebook tells me that i haven’t posted anything in awhile…. this year i’d like to try to be a little more consistent and post lots of great ideas and a bunch more freebie printables. it’s a goal i have, so stick with me and we’ll see how this plays out! :: myself. someone asked me a few weeks ago what i like to do for fun…and i didn’t know what to tell them! it seems like motherhood has taken a priority in my life (as it absolutely should!) but i don’t want to lose my own hobbies and interests in the process. i’m thinking of taking up lettering. maybe reading a few novels. maybe i’ll even finally commit to learning how to be a good gardener! who knows! i’m still thinking about it. but whatever it is, i need to make sure to set aside the time for it or it’ll never happen. that’s why i love printing out these monthly calendars so that i can write in the most important things first! my month will no doubt get filled up with other day to day obligations, of course, so i’ll make the space for those things that usually get crowded out as soon as it’s printed! in permanent ink. and then everything else can just fall into place. are you looking to get the most important things into your schedule first too? 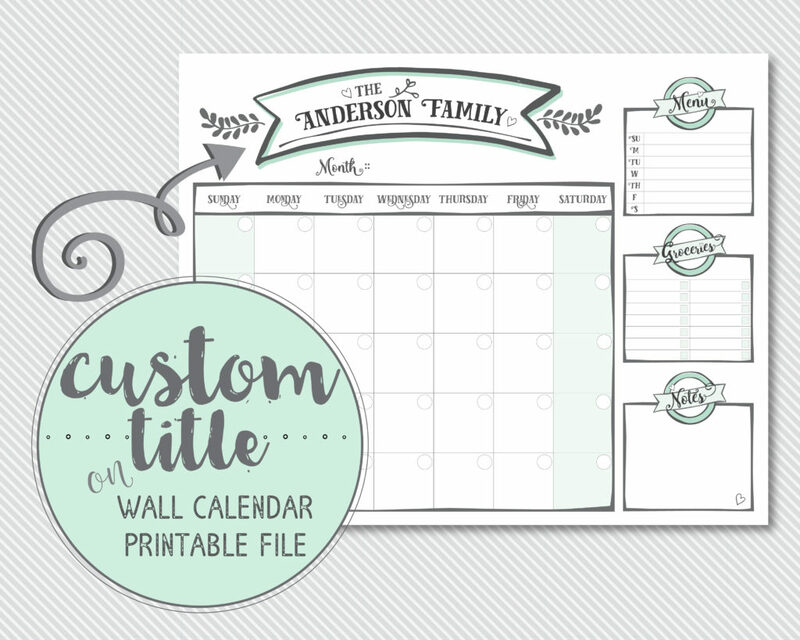 i’ve got a copy of this free printable january calendar with your name on it! just click the link below to download and then print! 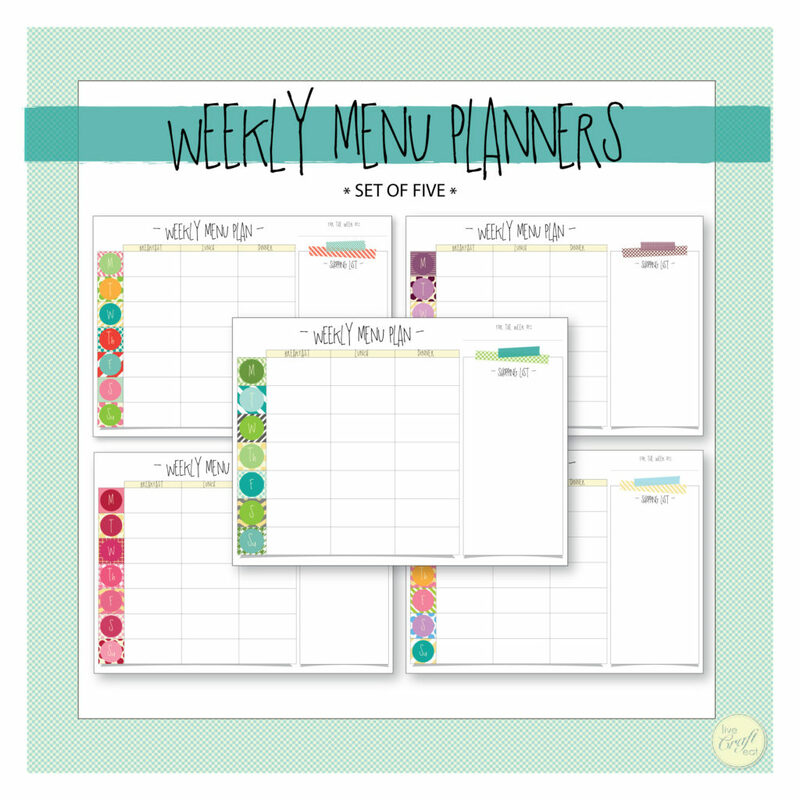 whether you’re planning out appointments, assignments, menus, or your daily to dos, this is the perfect way to organize yourself this year! 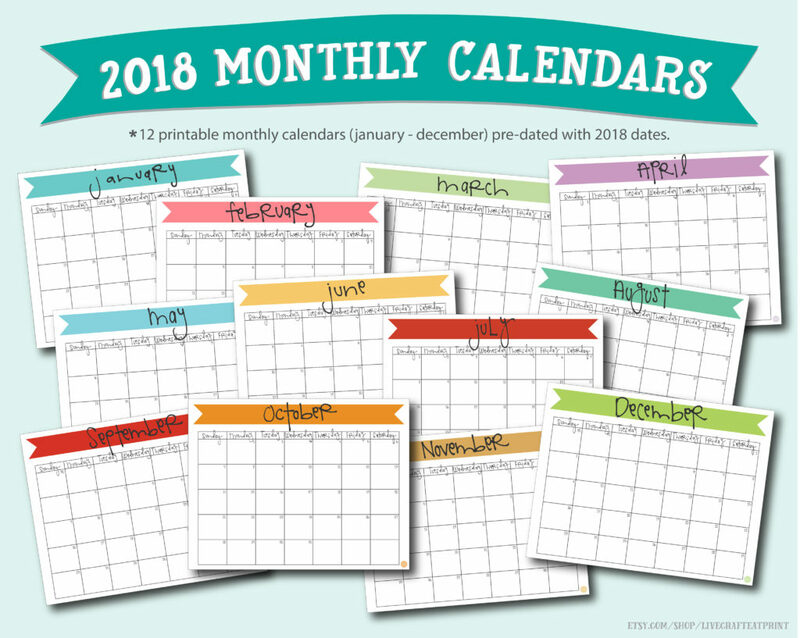 these freebie printable calendars are posted at the beginning of every month, so keep coming back to get yours! 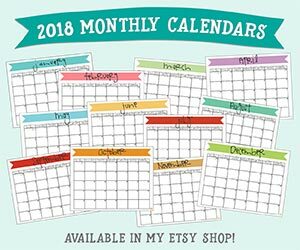 but if you’re interested in getting the whole year at once, i offer these banner calendars, amongst other things, in my teensy tiny etsy shop, livecrafteatprint <- thanks for supporting my little blog/shop! 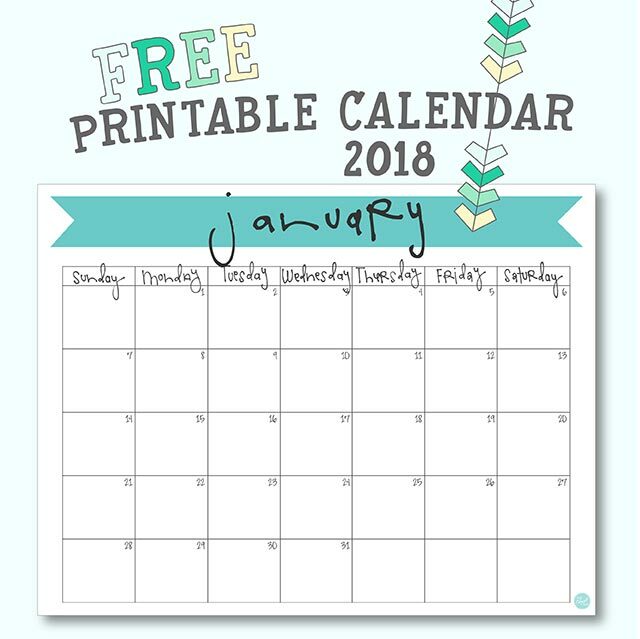 click here to download your free printable january 2018 monthly calendar! if you’re interested in these calendars, you might want to check out my etsy shop, livecrafteatprint, to see what else i’ve got for you! I am not able to get the 2018 calendar two page to print correct any way these could be emailed to me with the correct format? I changes my settings on my printer and computer and still unable to get the print out it still keeps cutting off Sunday no matter what my settings are or it prints a whole page. This would be for an a5 planner. 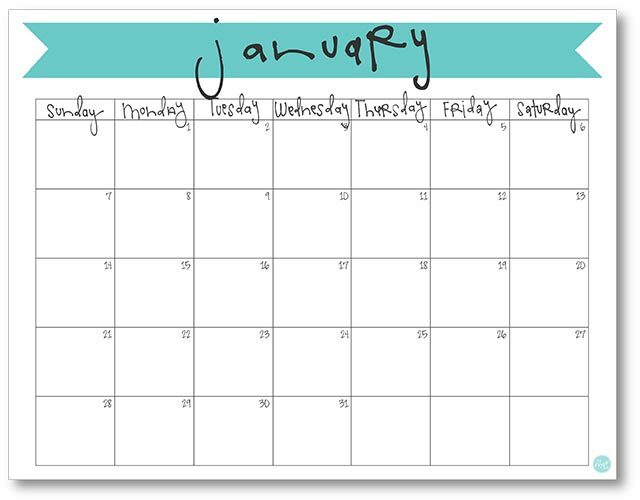 Regarding the A5 printable calendar that I have available elsewhere on my blog…are you printing on 8.5″x11″ paper with that size paper setting on your printer? It is meant to be printed on 8.5″x11″ paper and then cut in half to be an approximate A5 size. It wouldn’t really change anything if I emailed you the file because it is the exact same one that has been uploaded to the site. I’m not sure why it’s not working for you as I haven’t had many others say that they’ve had issues printing it. I’m so sorry, but hope you can get it resolved soon!